Best Urdu Ghazals and Nazms. Read gems of Urdu poetry, selected couplets and sher-o-shairi. Poetry in Urdu, Roman English and Hindi scripts at the Website. Desktop version gives better view. 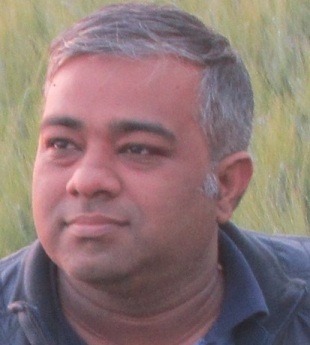 Suhail Kakorvi is an eminent Urdu poet based in Lucknow. He belongs to Kakori, the famous town in Awadh, known as birth place of legendary Urdu figures. उसने कहा कि ज़िद न कर दीद की तुझ को ताब है? usne kaha ki zid na kar deed ki tujhko taab hai? usne kahaa ki zindagi ab teri pech-o-taab hai. Jon Elia's Nazm: Tum jab aaogi to khoya hua paogi..
Mirza Ghalib's famous ghazal: Jab aankh se hi na Tapka to phir lahu kya hai? There is no need to consult anyone or get a tutor for Urdu. So get a Urdu primer for learning basics, and learn Urdu, here. It is really easy. Each Urdu verse and every Urdu word has been written in Hindi and English scripts, so you can tally whenever in doubt. Just give a try. 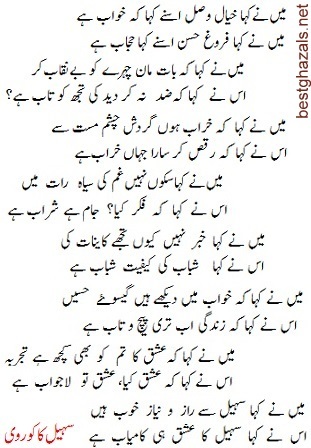 Bestghazals.Net is the first website to have Urdu poetry in three scripts ON THE SAME PAGE. It has crossed more than two million hits. Shams Ur Rehman Alavi is a journalist who lives in Bhopal. Apart from love for writing, he has interest in sports, poetry and specialises in cricket history and demography.